Tunnelling using a Tunnel Boring Machine (TBM), which travels at some depth below the ground and significantly reduces impact. Tunnelling by TBM from Mayoral Drive to an area beyond Symonds Street between New North and Mount Eden Roads. The main construction area will be at the southern end of the project adjacent to New North Road. The tunnel will be bored from this end to Mayoral Drive, the equipment dismantled and returned to the start for the second tunnel bore. Spoil from the tunnels will be removed from the Eden Terrace end. There will be smaller localised construction yard areas at Downtown and near the stations. Cut-and-cover is a method of civil engineered construction for shallow tunnels where a trench is excavated and roofed over with an overhead support system strong enough to carry the load of what is to be built above the tunnel. There are two basic forms of cut-and-cover tunnelling - the Top-down or Bottom-up method. 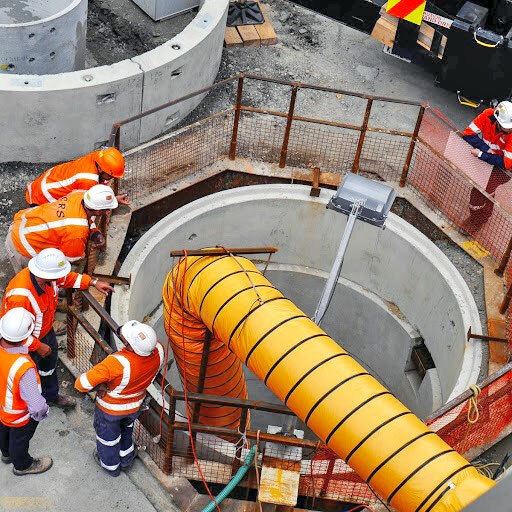 The CRL tunnels is being constructed using the bottom-up method where a trench is excavated and the tunnel is constructed through it, then carefully back-filled and the surface reinstated. 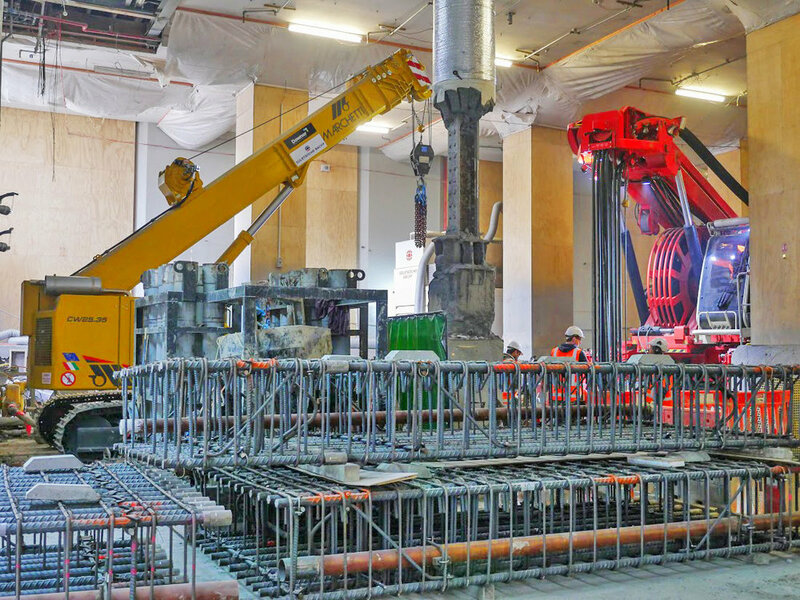 Both machines played key parts in the early stages of the City Rail Link construction. Pipe jacking is a trenchless construction method used to install pipelines beneath highways, railroads, harbours, rivers, and environmentally sensitive areas. Generally, pipe jacking involves a micro tunnel boring machine (MTBM) travelling from a launching shaft to a reception shaft. CRL used the pipe jacking method to create a new stormwater main along the eastern side of Albert Street, between Swanson and Wellesley Streets with caisson shafts to be constructed at Wellesley and Swanson Street intersections. 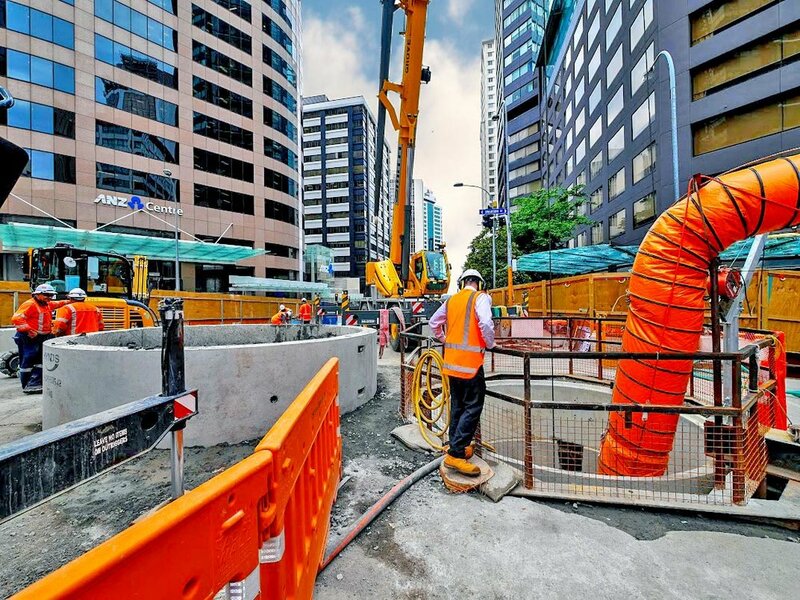 Two additional shafts were constructed in Victoria Street to enable strengthening of the Orakei Sewer Main across Albert Street. Traditiional pile driving rigs are usually composed of a tall framework in which either a weight is raised and dropped on a pile head or in which a steam hammer drives the pile. However CRL utilised a Cased Continuous Flight Auger piling rig which does not require a weight to be dropped. This technique is quieter and has less vibration compared to traditional piling. Also the cased nature provides improved ground support during piling. 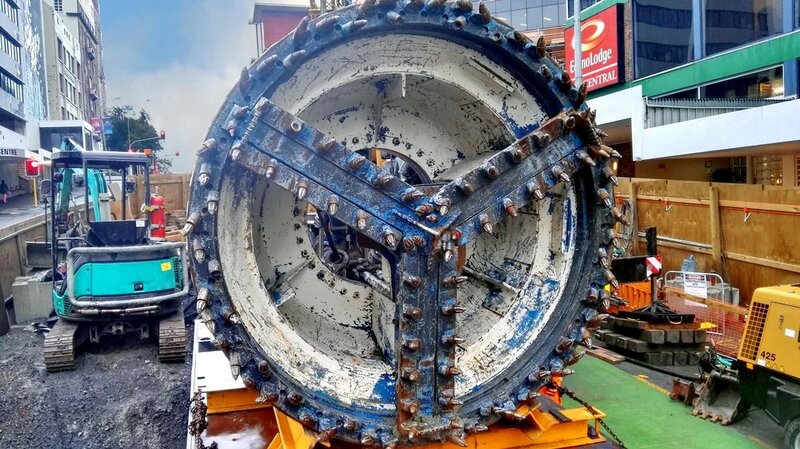 'Valerie’, was the 2m-wide tunnel-boring machine simultaneously excavating and installing a new stormwater pipe under Albert Street. 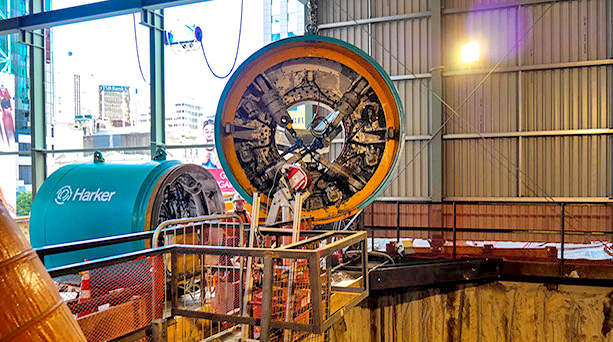 The tunnel boring machine (TBM) also known as a "mole" excavates tunnels with a circular cross section through a variety of soil and rock strata. TBMs are able to bore through anything from hard rock to sand. 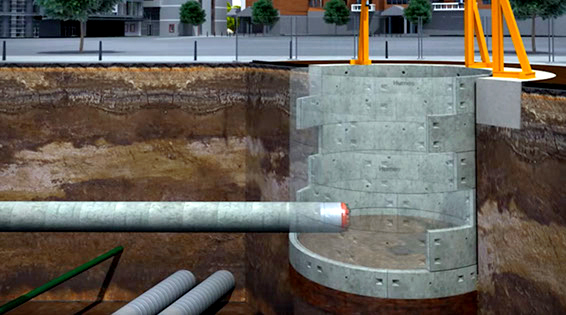 Tunnel diameters can range from a metre (micro-TBMs) to around 19m. Valerie was named as such by school children in a contest in praise of the mighty Olympic shot-putter Dame Valerie Adams. It started tunnelling and pipe-jacking work from the Victoria Street on 21 November 2015. By the time she arrived at the Swanson Street reception shaft early 2017, she had travelled 290m. Valerie was returned to the launching shaft and travelled another 200m in the opposite direction - 490m in total. In late April 2017, Valerie was pulled out of the Victoria Street shaft after finishing the stormwater work. 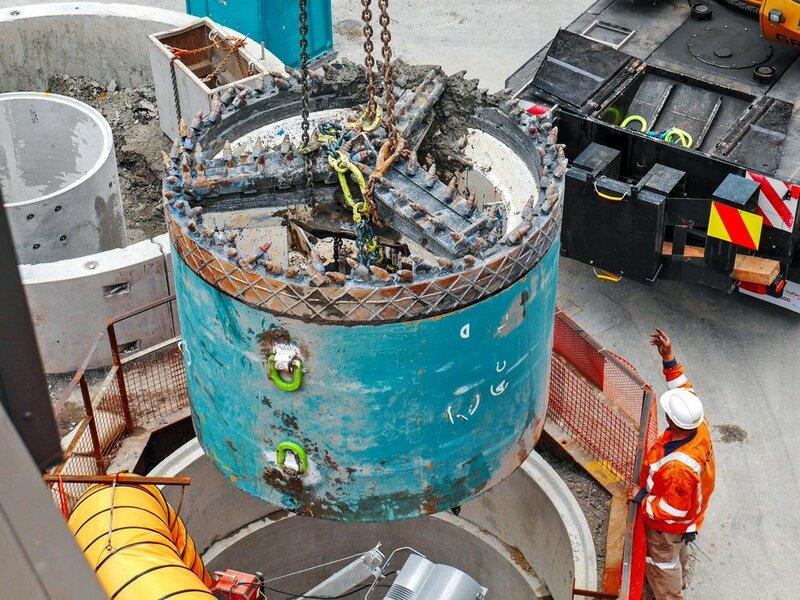 Tunnelling by a much bigger TBM is required to construct the CRL rail tunnels from Mayoral Drive to an area beyond Symonds Street between New North and Mount Eden Roads. It is proposed that a 7m diameter TBM will be used to bore from the location of the Mt Eden Station to Mayoral Drive (Aotea), then transported back to that site to bore a second tunnel from the Mt Eden Station to Aotea. ‘Gomer’ is a nine-storey-high piling rig used on Albert St. In all, Gomer dug 372 piles of up to 20m deep. It was affectionately named after 1960s TV character Gomer Pyle. Howard McNear played a car mechanic in the long-running American sit-com The Andy Griffith Show. The rig was was affectionately named after 1960s TV character Gomer Pyle. Howard McNear (pictured) played a car mechanic in the long-running American sit-com The Andy Griffith Show. The rig played a major part in preparing for the tunnel construction in the building. The rig first began work around the outside of the building in Lower Queen Street and then in September 2017 was brought into the actual building. With Sandrine's help, 64 diaphragm walls (or D-walls) were built by the Downer Soletanche JV CRL construction workers. The wall panels form the structural support for the tunnels to be built in the building and also prevent water ingress. A D-wall is a continuous wall constructed in the ground, typically to form an underground barrier or structure. They are constructed by an engineered fluid, typically a sodium bentonite mud, which is later replaced by permanent concrete. Sodium bentonite is an absorbent clay that expands when wet. Bentonite slurry (a mix of bentonite powder and water) was pumped into the trenches being excavated for the diaphragm walls to ensure the sides don’t cave in and ground water levels remain constant. The walls are to be part of the permanent structure being built by supporting the building and the CRL tunnel box. Sandrine is a compact hydrofraise piling rig - explained below. The rig is named after Sandrine Mussier (pictured), who has worked for CRL contractor Soletanche-Bachy for the past 20 years, looking after its international project staff. During Sandrine's work at the CPO, passers-by got used to seeing the huge 10m high distinctive silos in Lower Queen Street. The silos were part of a specialised bentonite plant, shipped over from France by CRL contractor Downer Soletanche-Bachy Joint Venture, to help with the construction of those diaphragm walls to support the CPO building foundations and the CRL tunnel box. A tunnel boring machine was needed to kick off CRL preparation work in Mt Eden. In early 2018, contractors started diverting a section of the existing Mt Eden stormwater pipe and creating a new alignment between Water and Nikau Streets so that CRL could create a redeveloped Mt Eden train station. The existing stormwater pipe was in the path of the new CRL tunnels that will be built at Mt Eden. 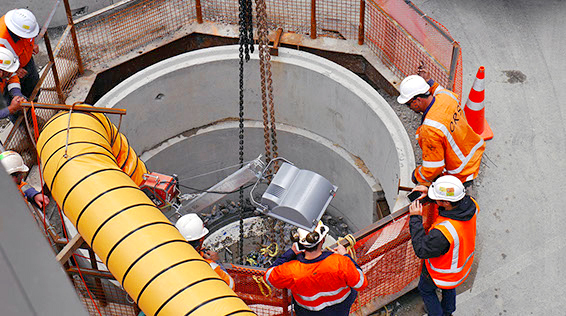 At Mt Eden, shafts at Water and Nikau Streets provided underground access for the micro tunnel-boring machine simultaneously excavating and installing the new stormwater pipe using a pipe jacking technique and a deep access chamber at Mt Eden Road . And the tunnel boring machine’s name? Naming digging equipment after women is said to be a tradition that dates to the 1500s when miners prayed to St. Barbara to keep them safe underground. Saint Barbara is the patron saint of armourers, artillerymen, military engineers, miners and others who work with explosives because her legend associated her with lightning. More than 30,000 people from as far away as the UK, USA, Europe, the Philippines and Afghanistan participated in the naming contest run in just under a week on CRL's Facebook page. The most popular name by far was Jeff. Thousands of people voted Jeff based on the popular meme “My Name is Jeff” which was a line used by the character Greg Jenko in the 2014 action comedy film 22 Jump Street. So Jeffie, an aligned feminine name was used. Jeffie was a popular girls name in the early 1900s. Bentonite slurry walls (also known as diaphragm walls) are used in construction, where the slurry wall is a trench filled with a thick mixture of bentonite and water. A trench that would otherwise collapse due to the hydraulic pressure in the surrounding soil is prevented from collapsing as the bentonite slurry balances the hydraulic pressure. Forms for concrete, and rebar, can be assembled in a slurry-filled trench, and then have concrete poured into the form. The dense liquid concrete displaces the less-dense bentonite slurry and causes the latter to overflow from the trench. The displaced bentonite slurry is then channeled to a recycling unit from which it can subsequently be reused in a new trench elsewhere on the construction site. Two bentonite recycling units were established within the Lower Queen Street area to aid with construction of diaphragm walls through the old Downtown Shopping Centre site. Diaphragm walls were also being used for ground support and for propping while tunnels were constructed beneath the CPO building. BENTONITE: Bentonite was utilised while digging the structural support for the tunnel walls to ensure the excavation doesn’t cave in on itself. JUNE 2017- Bentonite plant foundation slab prior to a 240m3 concrete pour. A diaphragm wall (or D-Wall) is a continuous wall constructed in the ground and typically to form an underground barrier or structure. Diaphragm walls are constructed through a narrow trench, excavated in ground and supported by an engineered fluid (typically a sodium bentonite mud) which is later replaced by a permanent material (concrete). A diaphragm wall would typically be constructed as a ‘perimeter’ to prevent water ingress, for example. Diaphragm walls created under Lower Queen Street from the CPO Building enabled CRL tunnels to be formed. 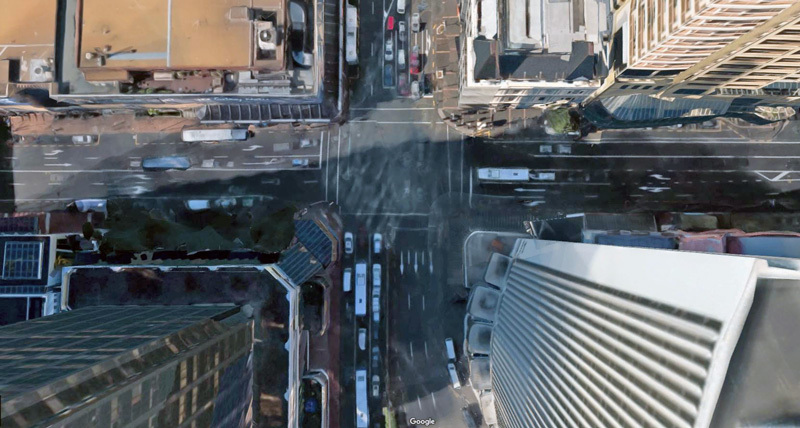 The Commercial Bay work was under the umbrella of Precinct Properties, not CRL. A caisson is a watertight retaining structure. It can be used for, say, the purpose of gaining access to an existing underground service but in the case of the CRL, it was for forming reception shafts for the pipe jack works along Albert Street and at the points of connection between the new line and existing lines. Segmented caissons are formed to create permanent portal entries to enable the Microtunnel Boring Machine (MTBM) to bore new stormwater pipes. There were caisson shafts at Wellesley Street and a second shaft at Swanson Street. Secant pile walls are drilled piles constructed in such a way that the piles overlap each other to form a wall. This is done to find drilling soft piles in hit and miss sequence and then drilling hard piles to interlock with the soft piles. Secant piles are used to build cut-off walls for the control of groundwater inflow and to minimise ground movement. Soldier piled walls are effective as a temporary means of retaining the sides of bulk excavations and to form the retaining structure along Albert Street to enable construction of cut and cover tunnels. Soldier piling was also used to construct two deep access shafts at the Victoria and Albert Street intersections to create a cavern to enable the Orakei Main Sewer to be bridged and strengthened. Soldier piles are constructed of wide flange steel H sections spaced at intervals of 2 to 3m apart, driven in prior to excavation. As excavation proceeds, horizontal timber sheeting (lagging) is inserted behind the H pile flanges. In order to clear the way for CRL construction the diversions of many essential utilities is required. This includes stormwater, water, and wastewater pipes, electricity cables, telecommunications cables, gas pipes, and any other service conduit that needs to be safely relocated for the benefit of the service providers and their customers. MYSTERY HUNT: Potholes are dug in streets such as here in Albert Street to find out what utilities are beneath the surface. Existing As-built records can be notoriously inaccurate and/or vague especially if those records are decades old, so identifying the owners of the utilities can be quite a task if the utilities are found to be not where the records say they should be! Here’s a map of the utilities we’ve discovered on the corner of Albert and Victoria Streets.